Designed by Lievore Altherr Molina, Meety mimics the adaptable system of Catifa in table form. Inspired by the architectural structure of bridges—at once strong and lightweight—Meety’s aluminum legs form a solid structure from which the top appears to float or hover. An adaptable and dynamic system of tables engineered to be optimally customizable, Meety retains its unique character from its cast aluminum legs that seamlessly integrate into multiple tabletop options: size, scale, and material. Diverse customizations create options for tailoring this elegant system to any context — for home, for work, for life. The Meety system is widely customizable, with tabletop shape options and in a range of materials from laminated MDF to FENIX NTM®, from wood to glass. The round (Ø 120 cm), square (120X120cm) and rectangular shapes (started from 70X140 cm) were envisioned for use in large seating environments, while the soft and fluid soap shape has a singular presence and appeal. 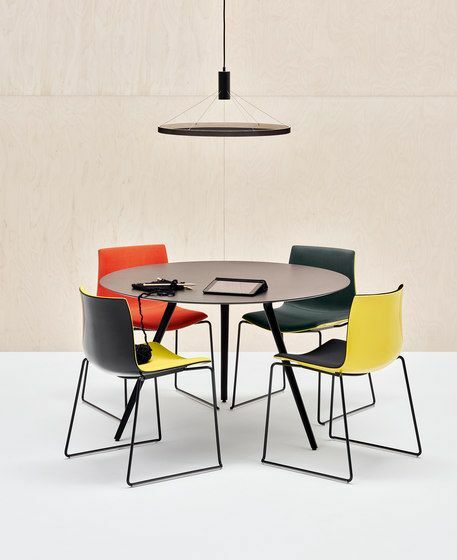 The trapezoid tabletop shape was created to respond to the collaborative work environment and can be combined into different configurations to create private space or openness in the workplace.